Huffington's new book "Thrive" talks about redefining success. 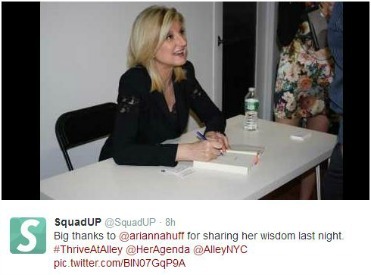 Arianna Huffington paid a visit to Alley NYC in Midtown yesterday for a short presentation about the importance of sleeping, logging off your electronic devices and following your passion. She’s got a new book for sale — Thrive: The Third Metric to Redefining Success and Creating a Life of Well-Being, Wisdom, and Wonder — and these are just some of the ideas that she puts forward. And her audience, a very receptive one, were largely millennials, who seemed to genuinely appreciate being told that, at some point, they can stop working and just go to bed. Huffington, the chair, president and editor-in-chief of The Huffington Post, says she literally collapsed in April 2007 after working long hours on the site. Waking up in a pool of blood, she decided it was time for a change. The book discusses the new ways in which we should redefine and attain success. In broad terms, that means finding a balance between what you love and what you need. Calling herself a “sleep evangelist,” she talked up the need for rest and time without the Internet. And in deciding what you need to accomplish, determine which things you really care about. For her, that meant cutting loose dreams of being a great skiier. She says she’s terrible on skiis and she just gave it up. And with that, she can say she’s done with it. “I sit by the fire with a hot chocolate and a good book,” she says of her ski trips with her children now. Alley NYC is a 16,000-square-foot “entrepreneurial hub” and overall hive of collaborative activity. While guests waited to get their new copies of Thrive signed, some people still appeared to be working. Her Agenda, a group for millennial women was also a sponsor. So there was definitely a target group in mind. And studies besides the one highlighted here all show that millennials want to do work that isn’t just about making money and having fancy titles, but rather helps the world, creates a life of worthwhile experiences, and leaves personal time. Judging by their enthusiasm about Ms. Huffington and her message, she’s speaking to an audience that wants to hear what she’s saying.